With some imagination, lots of perseverance, and a little help from you, your child can build a successful small business that will raise his income and his money IQ. Here’s how five kids did it, and how your child can, too. When she was nine-years-old, Amber Liggett’s parents gave her a balloon art kit for Christmas containing a couple balloons, a pump, and a book. "My mom and dad were amazed by the creation I made," the Beaver, PA, teen recalls. 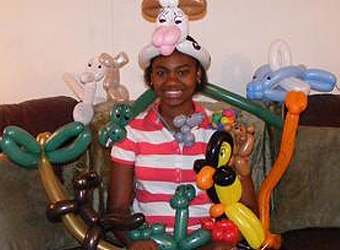 "My mom told me if I kept up making the balloons, she would help me start a business. Now I have it as a job, and I love it!" Today, Amber earns between $65 an hour ($35 each additional) twisting animals, hats, and bracelets at one or two events each weekend. She also earns $17 per hour teaching workshops at a local community college. Amber gets work through customer referrals and by leaving business cards at venues. Although she has to compete against other artists, she says she gets more work because she’s young. How to get started: About $50 will get you two pumps (in case one breaks), a pack of Sharpie markers and a bag of balloons. Amber recommends getting the better quality Latex 260 balloons. In eighth grade, Jack Carpenter and his friends battled their boredom by creating a video. This sparked an inspiration for filmmaking. Now the 17-year-old, one-man crew earns a regular income by creating video productions for his high school and for businesses and individuals near Ballston, NY, where he lives. Anybody can get into video production, says Jack. While it helps to have a good eye, you don’t need special skills, just determination and patience. And being a teen definitely helps. "Once people recognize what I can do, they are a lot more impressed because I’m young," says Jack. Jack earns anywhere from $50 to $800 for a project, but limits his work to one or two at a time. Google ads placed on his popular YouTube videos earns him an additional $100 per month. He saves much of his earnings and reinvests the rest, upgrading equipment to improve his productions. How to get started: You can use any digital camera with a video feature. Start with video editing software that you can download for free or that comes preinstalled on your computer, like Windows Media Maker or Apple iMovie. If you have a few hundred dollars, get a video camera that uses mini DV tapes. Jessica Cervantes couldn’t have dreamed that the concoctions she mixed up in the kitchen with her grandmother would end up at the Super Bowl. But that’s exactly where her culinary creations were featured this year. Cervantes’ Popsy Cakes—an assortment of cake balls from chocolate to pistachio to red velvet—can be customized with swirls, scribbles, sprinkles, and ribbons, and baked on a pretzel, wafer cookie, or lollipop stick. Jessica started Popsy Cakes with an initial investment of $300, which she took from her savings. She gave free samples to family, friends, and schoolmates, and asked them to help spread the word. Popsy Cakes were initially sold for $2.50 to $3.00 each, but she soon realized that her low price barely covered ingredients, electricity and delivery costs. Today, the handmade treats are sold at a kiosk at Miami International Airport and online for $5 a pop. How to get started: Jessica says that a great business plan is key. During a yearlong high school entrepreneurship course, she created a plan for Popsy Cakes that included a mission statement, the company’s legal structure, a time-management strategy, income and return on investment projections, and a financing strategy. Jessica won a national business plan competition sponsored by The Network for Teaching Entrepreneurship. Look for similar young entrepreneur programs in your community; many colleges have one. Christian, of Delmar, NY, earned his first income at age 11 by mowing a 90-year-old neighbor’s grass. Now, earning a minimum of $20 to $35 per yard, he regularly socks away $100 each month in an investment portfolio, and pays insurance and gas costs for the truck he bought with his own money. "The biggest challenge I faced as a young business owner was negotiating prices," says Christian, who says he shortchanged himself at first. "I get the most business by word-of-mouth, from people saying, ‘Hey, this kid does good business.’"
Christian says he owes his success to the relationships he builds with his customers. "Sometimes I go in and have a cup of tea or hot chocolate, something a corporation isn’t going to do." How to get started: First, Christian says, work for the people around you—neighbors, friends, family. Second, start small. Don’t get in over your head, and be smart with your money. You don’t need a $600 John Deere mower. Borrow your parents’ lawnmower, and pay for the gas, or buy a little 21-inch push mower. "Lots of teens want jobs and don’t want to ask parents for money," says Amber, who started crafting greeting cards with colored pencils for friends at age nine because she didn’t like what she found in stores. Today she creates all categories of cards (birthday, congratulations, sympathy, holiday) with paints, photography, and her favorite—relief printmaking. She sells them to friends or at local fairs and events for $3 each or $18 for six. "I’m pleased with the outcome," says Amber. "I have money to save for college and money to spend. It’s a good balance." How to get started: A greeting-card business is probably one of the easiest businesses to start because all you need are pencils, crayons, and paper, says Amber. If you want to make multiples of the same card, you’ll need a scanner, a printer, and access to a computer as well. Awesome! Great creative ways for kids to make extra money. Cha Ching!